Eyes to the Hills | Lifting my eyes. Finding my joy. Sharing it with others. October is not my favorite month. I’m not a fan of witches and other creepy creatures that make their appearance in store aisles, and I don’t really appreciate the previews for movies I’d never in a million years want to watch coming on in our living room when we just want to enjoy a football game with the family. Not to mention, the amount of candy that finds its way into this house, and maybe also my mouth, is more than a bit unnecessary. If it weren’t for the fact that my favorite girl was born in that month, I don’t think October would even make it into the top 10. This particular October was a bit better, though. Mostly because the kids and I kicked off the month with a car accident on October 1st. 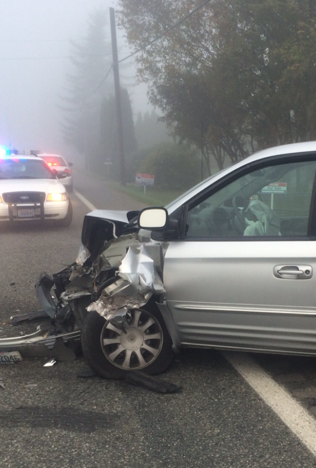 I know what you’re thinking: Car accidents aren’t usually something to celebrate. True. Only here is the thing about unhappy surprises and totaled vehicles… they sure are great reminders of what is actually important in life, and they are perfect opportunities to see God at work. So here it is now, nearly 8 weeks since the accident, and I have yet to share how much God has done for us. He showed up on that foggy morning in October – in more ways than one. While it isn’t unusual for us to leave the house late, the kids and I piled in the van and left a few minutes ahead of schedule. That was a good thing, because I hadn’t realized how thick the fog was until we were already on the road. The majority of our drive to school is spent heading west on Birch Bay-Lynden Road, a 50 mile-per-hour road with one stop sign about half way to our turn onto Custer School Rd. I had reached my full speed after the stop sign when I saw the truck pulling out of a driveway just barely ahead on my right, crossing over in front of us to turn left and head east. He was in my lane, and I was about to plow right into the driver’s door. I remember thinking, “He’s going to die!” as I swerved to the right, trying to avoid the collision. As quickly as the thought passed, I saw what I was now headed towards. The man was pulling a flat bed trailer with a massive piece of farm equipment on it, and my thought quickly changed to the fear that I was the one who wouldn’t make it, that the farm equipment was going to crush me. I remember the impact, the car fishtailing, being amazed that the corkscrew shape metal on the plow hadn’t gone through the windshield, and then sitting there at a standstill staring at the airbags that had deployed, surprised at how small they actually are, thinking about the Statue of Liberty being the same kind of small surprise. The kids were screaming in the back, both holding their chests where the seatbelts had held them tightly. They were complaining of pain there, but nowhere else. I wondered if they had broken any ribs. I tried to open my door to get out, but it was jammed shut. I could feel pain in my knee and knew I couldn’t climb to get out another door, so I decided to wait. The kids started to calm down and assured me they were okay. While I talked to the 911 dispatcher, the other driver got out of his truck and tried opening my door from the outside but to no avail. I called her. She answered. I went from calm to hysterical in about 2 seconds. So did she. By the time I got off the phone, Jacob had gotten pretty worked up again, because it was all super scary. And because his chest hurt. But mostly because of the amount of panic coming out of his mother. It was about this time – when I was panicking and getting super frustrated with the door that wouldn’t open and the electrical locks that wouldn’t work – that my 1-week-shy-of-turning-8-years-old girl calmly said, “Mom, don’t worry about the doors. I unlocked mine. I can get out. See?” And sure enough, she had opened her door and was calmly unbuckling. She didn’t climb out yet, though, because she was staying close to her brother who was pretty upset by now. “I’ve got to get him,” I thought. I absentmindedly reached for the door handle so I could get out, and my door easily opened. It wasn’t until I was out of the car that I realized I had just exited the same door that wouldn’t open from the inside or out just one minute earlier. As I reached in to get Jacob, I saw an officer that had just arrived heading towards us. I couldn’t believe it when I saw him. Deputy Pete Stevenson is a family friend, the dad of one of my dearest friends in the world, grandpa to Annalise and Jacob’s bestsest buddies, the worship leader at our church, a guy I sing and laugh with often (usually at the same time), and a man I love dearly. He and his wife are the sweetest people you’d ever meet, both servants in all they do, and they’ve been a huge support to Matt and me. He could have been anywhere in the county, yet here he was headed towards me just minutes after our accident, before anyone else arrived. Around the same time, I started to set Jacob down so I could hug Annalise, but he wasn’t ready to let go. He was pretty shook up and just wanted to be held. While I felt badly about it, I didn’t give him a choice: I needed to check on my girl, too. As I set him down, Pete and I saw a man walking towards us – Pete’s brother Phil. Phil is our pastor, another family friend, another guy we love dearly, and one of Jacob’s all-time heroes. As I hugged Annalise, Phil scooped Jacob up and hugged him tight. Paramedics had not yet arrived to look us over, and Pete had just been scanning around for a warm place for us to sit down. (He has since told me he was worried about me being a “walking wounded,” internal injuries or bleeding and unaware because of shock.) He had Phil pull his car up so we could sit. Phil also called Matt and let him know what was going on and that we were all fine. Paramedics arrived and asked me to climb in so they could look me over. By now, a third comforting face had arrived – my boss of many years. He climbed in the ambulance with me. I wasn’t alone. My kids weren’t alone. By the time I got out, they had already been checked over and were calmly sitting in the back of a warm car, Pastor Phil’s arms around them. All was well. Matt arrived shortly after and took our family home. Home. No one went to the hospital. No one required further attention. The kids had a dance-off for my entertainment. My boss, our awesome secretary, and the 2 other members of Custer’s third grade teaching team (a.k.a. the wind beneath my wings) made sure my afternoon shift was covered and plans were done so I didn’t have to do a thing. Except continue watching the dance-off, of course. A friend from church texted me to tell me she was bringing us dinner. She had driven by the accident and didn’t stop because she saw we were well taken care of by Pete and Phil, but she wanted us to not have to worry about dinner. Pete’s wife Judy brought us fresh home-made biscuits, jam, and soup for lunch. I still don’t know how she whipped it all up so quickly. My dad – who was on a call this way from Oak Harbor, stopped by for hugs, as did Matt’s mom. Another sweet friend who heard the news brought cookies and flowers. The next day, the kids and I were back at school. I was able to be in our rescheduled staff picture in memory of my co-worker. People were surprised to see us there perfectly fine, save one swollen knee, a cut on my leg, and a few seat-belt bruises. From beginning to end, October 1st felt like one miracle after another. God’s protection from harm, provision in the form of people we love bringing comfort, warmth, care, food, laughter, and love. His perfect timing in placing Pete just minutes away on his shift that day and Pastor Phil unknowingly just a few cars behind us on the same road. Even a car door opening after it would not previously budge was so clearly the hand of God. Miracle after miracle after miracle. So much so that I struggled to write this after our community has felt the pain of car accidents with tragic results. I don’t know why some accidents end in tragedy and some don’t. Or flights, for that matter. But I do not believe any of the events of that day happened by accident. I believe my God – in His limitless love and mercy – spared my family. I believe it was because of His great grace that He provided people we love to bring us further comfort in some very scary moments. And I believe when I don’t understand why, it is okay, because He knows a whole lot more than I do. It is not my job to know. It is my job to trust. He’s right. Phil was there at the exact right moment. And isn’t that just like God? Just what God does? He picks us up when we’re really scared. Right when we need comfort and peace in the middle of our storm. He just picks us up and holds us tight. And His timing is always perfect. As is the case for many others, this year has not been easy for our family of four. On January 3rd, we lost our second set of twins to miscarriage. On June 27th, my Auntie Jill passed away at the young age of 62. In September, Annalise’s kindergarten teacher – a co-worker and friend of mine – passed away as well. But can I tell you what the Lord has done for us? He has provided comfort and encouragement. He has sustained us. He has answered prayers of protection. He has surrounded us with loving family and friends. He has blessed us with a new home, a new van, and an abundance of joy. The God who is great and mighty and has command over angel armies has not left our side for a moment. He has held us tightly through it all, and we will continue to follow Him through the good and through the storms. He is good, faithful, loving, and unchanging. He is our only Hope. And because I am always a slow learner and quick to forget, I will look at these photos often to be reminded of His gifts of grace. In the first one, the van front smashed in, but not enough to cause injury. Protection. And Pete’s car, first on scene. Comfort. And in the second one, Pastor Phil’s car behind ours. God’s perfect timing. And a reminder he holds us tightly. And that thick, thick fog. Although I cannot see through it to what lies ahead, I know the One who can, and I choose to put my trust in Him. Like many moms with school-aged kids, my weekday mornings have been about as fun as a barrel of monkeys. Not because a barrel of monkeys are something to enjoy, but because weekday mornings feel a lot like you’ve opened an actual barrel of real live monkeys, and you are now trying to wrangle them into the car with clean clothes, full bellies, and a house that has survived the process. Yes, I only have two children. I get tired of the same battles. I get tired of repeating the same list of morning jobs. I get tired of them acting shocked every time I ask them to do a job they’ve been asked to do every day for the last 6 years. But I am mostly tired of sending my most precious little bundles off into a crazy world after a morning of hurriedness and harping. No one enjoys it, and it certainly isn’t starting any of our hearts in the right place. This year, I was determined we would not succumb to the morning madness. We made several changes that helped assure a morning of peace and time spent together that we actually enjoy. The minutes together go so quickly; I want to cherish them. Some of the changes we made were simple and obvious, like clothes being set out the night before, backpacks and folders ready to go before bed. This was part of our plan before, so the next change we made was actually following through on that plan. Other changes involved a little more preparation, but the result has been better than I ever imagined. The biggest of these changes was on packing lunches. After just 2 years of packing lunches for just one child, I can not tell you how much I was so over it. And now it would be lunches for two kids with very different tastes: one a backwards-clothes-wearing-vegetarian, the other prefers filet mignon or thinly sliced pickles on tuna that has been mixed just so. Don’t get me wrong, I love serving my family. I just don’t love throwing away uneaten sandwiches, fighting the urge to buy processed garbage that is convenient and also kids’ favorites… but still processed garbage, throwing away uneaten veggies, kids getting tired of the same thing every day, throwing away ALL OF THE WASTED THINGS, running out of important lunch items and not realizing until the moment I’m packing them. Which is almost never 5 minutes after we are supposed to be leaving. My first thought was to have the kids pack their own lunches. Then I remembered I like my kitchen clean and don’t so much love mayonnaise on the cabinets or children bleeding because they’ve been accidentally pierced with a knife by a sibling who is trying to slice apples. Not that that has ever happened. But it most likely would if I gave my barrel of monkeys sharp objects. So no, they would NOT be making their own lunches. Then I saw a post on Facebook of someone’s idea for pre-made lunch bins where kids pick what they want from each bin and pack their own lunch. I liked the thought, but I noticed the bins were full of lots of processed or pre-packaged foods. So, I decided to make my own version of pre-made lunch bins. 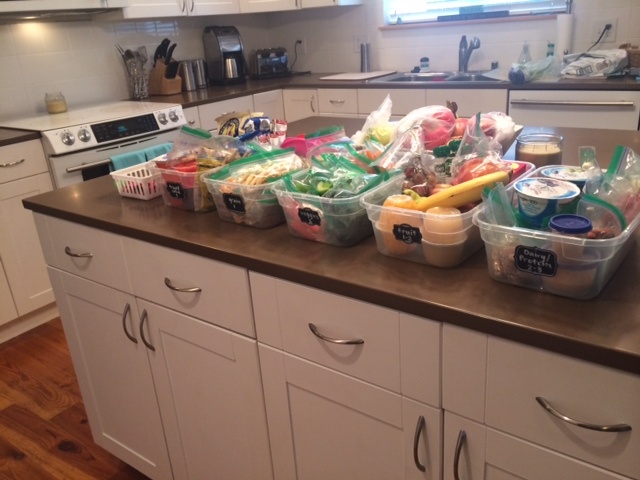 Because I spend the last two weeks of summer in my classroom, and because my kids are lucky teacher’s kids and get to end their summer early to come with me, we started packing lunches 2 weeks before school started. That means the lunch bin plan started a week before that, in mid August. The three of us sat down together, and I asked them what kinds of foods they liked and would be willing to eat in each of the following 5 categories: fruits, veggies, dairy/protein, grains, snacks/treats. I decided to keep fruits and veggies separate, because one child in particular would never eat a veggie in his life if given the choice. (Ironically, this is the same child who is a vegetarian. Maybe a fruitatarian would be a more fitting name?) I wanted him to have both fruits and veggies, so they each get their own category and bin. I combined dairy/protein for the same child who does not eat meat, but gets protein in other ways, including lots of Greek yogurt. This first sit-down meeting with the kids was crucial in starting our new routine. If I was going to take the time to fill a bunch of bins with food, I was not about to throw that food away later. It needed to be food they would be willing to eat. We even spent some time roaming through the produce aisle to find more veggies that could be added to our list of options. Next, I bought 5 shoe-box bins from the Dollar Tree and did some grocery shopping. Also on my list, snack size bags, sandwich size bags, and mini plastic containers for peanut butter and other dips (thanks, Tana, for that idea!) On that first Sunday, and every Sunday since, I’ve spent a bit of time (anywhere from 20 -40 minutes depending on what’s in bins that week), cleaning and chopping food, filling bags, and filling bins. There is a bit of prep involved, but the payoff has been so worth it. Each morning, the kids do their morning jobs using another system I implemented last spring (post to follow). One of those jobs is to pack their own lunches. They get out the 5 bins – 3 from the fridge, 2 from the pantry. (The fruit bin could possibly be stored in the pantry as well if you didn’t have enough fridge space.) They also set out a basket of cheap spoons and forks I don’t mind losing to the school trash can if they forget to bring them back. They then choose the designated number of items from each bin to fill their lunch bag and put the bins away. Angels sing the hallelujah chorus, and a beam of glorious light from the heavens shines upon our kitchen. Meanwhile, I’m sitting with my feet up, enjoying an extra cup of coffee that is still steaming hot, basking in the realization that I have trained my little monkeys so well. Actually, I’m usually in the kitchen enjoying the pleasant morning conversation – because there really is a morning calmness – while I empty the dishwasher. There have been a number of days where the entire process happens while I’m in the shower, and I come downstairs to a clean kitchen and packed lunches. No one is bleeding, either. Bonus. Last week, another miracle happened. We were all tired and moving a bit slow. I told the kids I’d help them out by packing their lunches for them. Near panic ensued, and my 5 and 8 year old kicked their pace into high gear so they’d have time to pack their lunches themselves. Because they love it. Did you just see that? 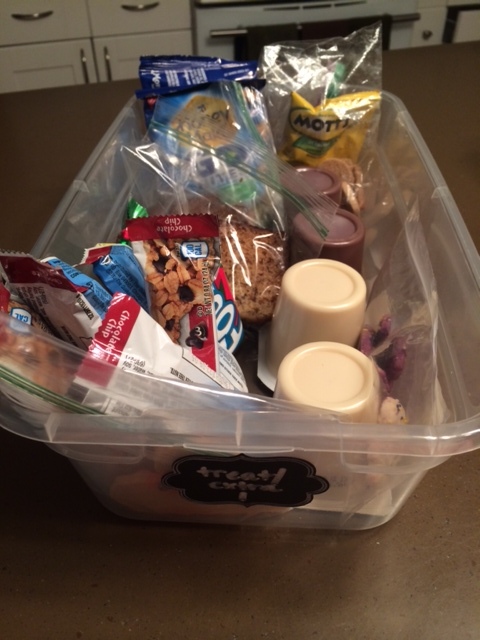 My kids love packing their own lunches. Both kids are eating healthier lunches than ever. Less sugar, lots of produce variety, healthy choices in all food categories. Some bins have a range of items. You can choose 1 or 2 veggies and 2 or 3 protein/dairy items. Most days, they choose the lower amount. But if they end up hungry, they know they can pick more the next day from any of those bins. However, they also know that if they waste food by not eating their veggies or other healthy options, they won’t be picking from the snack/treat bin the next day. 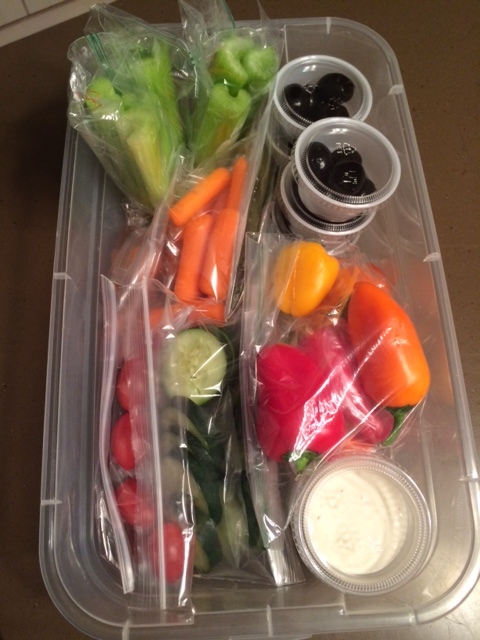 Because they are motivated to get a snack tomorrow, they are motivated to finish their healthy foods today. There have been a few times where the snack was not allowed for one child, and there were no arguments. The rule was understood clearly. In fact, the un-named child didn’t even ask, but packed the lunch sans snack, without a reminder. By picking 1-2 items from the fruit, veggie, and protein/dairy bins, the kids have enough food left in their lunch to eat a snack after school. 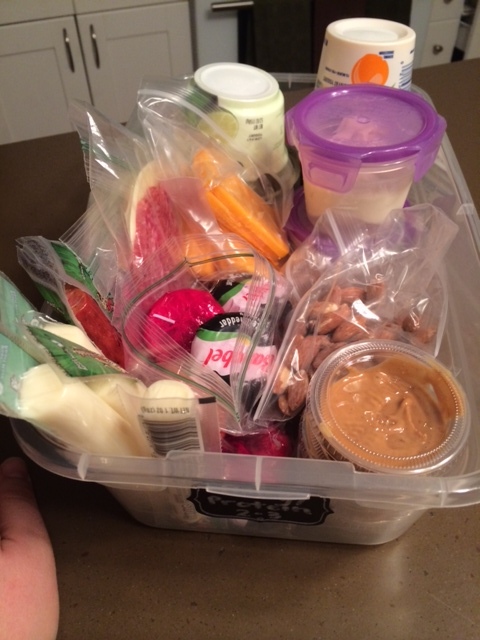 I’m no longer packing lunches, AND I don’t have to worry about an after school snack. We’ve had really good conversations about healthy eating. 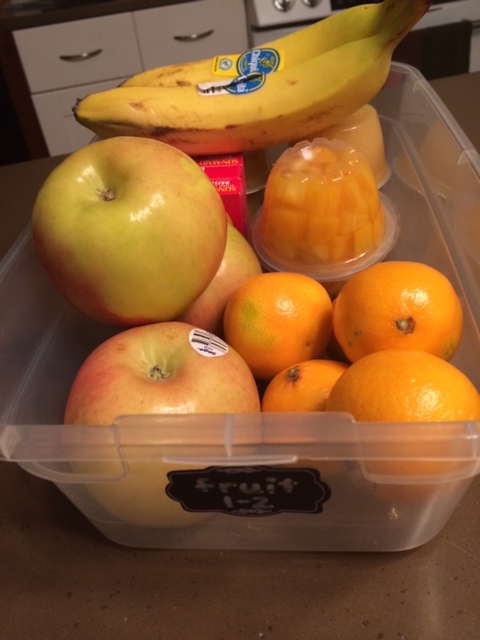 For example, the kids wanted to add juice as an option to the fruit bin. We talked about that nearly all the juice choices were made up of mostly sugar and other things they didn’t need. So they asked if juice could be a choice once in a while in the treat bin. Also, those fruit snacks they loved so much? Not actually fruit. Gasp. I’ve never once heard a complaint about lunches being boring or someone getting tired of a certain food. Food is not being wasted. No more 1/2 eaten sandwiches in the garbage. On the weekends, if someone is hungry, they may grab a snack – or even an entire lunch – from the leftovers in the bins. i.e. MOM ISN’T MAKING YET ANOTHER MEAL. We’ve had several evenings where we had to head out last minute. Instead of going through a drive-thru, I had the kids grab something from each bin before we hopped in the car. On the days where I am running late and don’t have a chance to eat at home, I grab my lunch from the bins too. Quick, easy, and healthier than other fast options. If you’re curious what kinds of things are going in the bins, I’ve included pictures and the lists my kids and I came up with below. Below that, I listed a few tips and things I’ve learned in the last 11 weeks, like what size olive is the right size to fit at least 5 into a plastic container (to fill one hand of course, which is a must when eating olives), or why the container is better than a baggie for olives. If you try the lunch bins too, I encourage you to come up with your own list with your kids’ input. I’d love to hear what you put in them. My friend Tana started doing the bins a few weeks ago (her kids love it, too), and it’s been great to be able to get ideas from each other. So go ahead. Make your bins. Then marvel at your independent little monkeys and your new found freedom. Other veggies we’ve included: sugar snap peas, green beans, sliced bell peppers, broccoli, 1/2 an avocado. GRAIN BIN (Choose 1) My toughest bin! I need ideas. 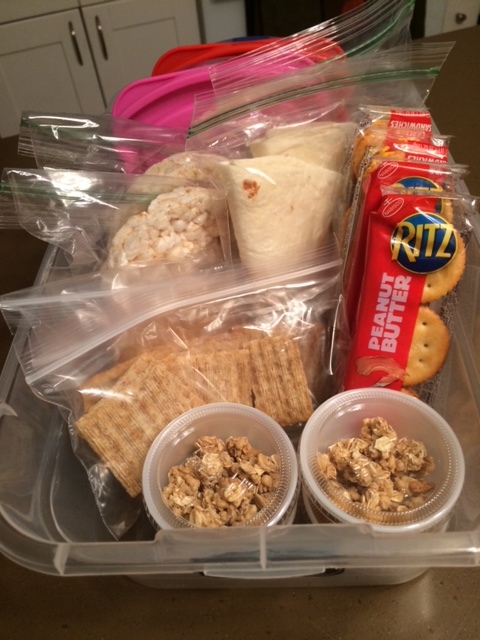 Currently holds: crackers (Triscuits), rice cakes, tortillas, granola (for the yogurt), peanut butter cracker sandwiches – which feel like more of a treat/snack than a grain, but sometimes we like to live on the edge, and sandwich boxes in case someone decides they’d like a sandwich. Which has happened exactly never. They’d rather eat the peanut butter with apples or celery, and she prefers her tuna out of a bowl. My kids aren’t as picky as I thought. Not a tip, just a new development. Add a little water in the baggie of carrot slices/baby carrots, and they aren’t yucky and dry by the end of the week. 5 Medium sized olives fit perfectly in a small plastic container. 6 is usually too much and results in at least one squished olive. Large olives are too big, so you can’t get 5. Olive travesty. Olives in a baggie “get smushy” and are not appetizing. Small containers are best. Whole fruits in the fruit bin are great, but since whole apples and pears are hard to eat for kids who have super loose or missing front teeth, we slice them the morning they are chosen. When slicing celery on a Sunday, wrap them tightly in foil or a paper towel before putting them in a baggie to keep them fresh for lunches on Friday or snacking on Saturday. Notice how I didn’t do that this week. Triscuits (original flavor) have exactly 3 ingredients. Whole grain wheat, oil, and salt. Lots better than other crackers’ ingredient lists. I mix tuna and a bit of mayo on Sundays and put it into 3 small containers per 1 can. I do this every other week so she doesn’t get tired of this option. Mixing up the bins week to week helps keep the excitement. Annalise loves avocado. 1/2 an avocado sliced while still in the peel is easy to scoop out with a spoon in a lunch. Squeeze a little lemon on it to keep it fresh for lunch time. Avocado slices freeze well and thaw great by lunch time, but they are a bit messier than scooping fresh chunks out of the peel. *This post was originally written on October 23, only a few weeks after I began my “Three-Things-Thursday” posts. Only I forgot to hit “publish.” And then I didn’t sit down to write for 6 more weeks. Found this today, hitting publish now. Oops. Turns out I am such a quitter. I’m just not made for the weekly writing of three things. I have to be inspired. I have to have a story. I have to have 5 minutes to sit down without falling asleep. By the way, just exactly when will that happen? Because I clearly remember my dad doing this when I was a kid. And now I’m… a lot older than that. And yet every time I visit him, Dad still falls asleep within minutes of sitting down. And he is 65. Was it always that way, Dad? Or did you have some years in between us kids sucking out all your energy and your old age sucking out all your energy where you could just sit without becoming comatose? Just kidding. My dad is a very hard worker. It isn’t his old age that makes him conk out. I believe it is his very efficient use of time that allows him to do so in the rare moments where he actually sits. Seriously. He works super hard while he is up, and he instantly takes good advantage of those precious minutes when he sits. This is evidenced in the fact that he is ultra picky with his food. As is Matt. Only they are picky with the exact opposite foods. Jacob likes no meat. Matt likes almost nothing but meat. Meal-making is a dream in this house. It is also evidenced in the fact that Jacob – and his dad – wake up chipper and ready to face the world, or at least talk to it. A lot. Without stopping. And their bodies move quickly. So very quickly for such early hours. Yesterday, Jacob got up, ran in to wake me up and say good morning. I sat up and said I just needed to go potty before I talked to him. In the 5 minutes it took me to stretch, stand, use the bathroom, find my cozy sweatshirt, and head to the coffee pot, Jacob had picked out his clothes, got dressed including shoes and socks, brushed his teeth, and made his bed. And he came running into the kitchen with a smile on his face. Before my coffee had finished brewing. I am not like them. I am not awake when I am moving around in the morning. My body is up, but my brain has not yet connected to my mouth. Or other parts of me, I think. Which is why I somehow ended up with toothpaste in my eye this morning. Not even kidding. I can’t tell you how this happens. I can only tell you that it is possible. And that it stings. And that flushing it with water takes longer than you might think, because it first gets more foamy before it finally rinses out. Which I guess makes sense, but doesn’t help the pain any. My four year old. Manipulating me with the idea of saving money. So he can get some fresh yummy bread out of the deal. Because apparently my store-bought bread isn’t good enough. So while I knew he loved it, I wasn’t sure what kind of chocolate cake he dreamed of. And in a moment of we’re-just-dating-and-I-am-trying-to-impress-insanity, I decided to make three from-scratch chocolate cakes for him to try. Yes, three. With three different from-scratch frostings. Clearly, I had no children to occupy my time. Nor did I have meals to dream up and make for various picky people. And obviously, I was still working on winning the guy over. Because that’s some seriously unnecessary overkill. I invited my beau over for the cake testing and tried to guess which one would be his favorite. I don’t think I had ever made a cake from scratch before, and now I had done 3 in one day. You can imagine the toll this took on me and my kitchen. You can imagine the anticipation and excitement built up as I served this tall and handsome hunk not one, not two, but three slices of his obsessively favorite dessert. You can imagine the dramatic reaction I had already imagined, like him suddenly dropping to his knee and proposing before finishing the third piece. Me: Dumbfounded. Anger rising. Don’t even bother pulling out a ring now, Buddy, because I’ll probably just smash it into your cake. Into one of them. One of the three. There were THREE. To be fair, this was many years ago, and my dear husband has grown much older and wiser since this comment. But unfortunately, he has not passed along this wisdom to our son. Who just today thought of the great idea of me hanging out with Mrs. Schouten to learn bread-baking. The good news is, my son is like his dad. What a good man to look up to and emulate. Oh, and the other good news: My husband’s obsession over chocolate cake is any of the boxed variety. With frosting out of a can. Which means I will never ever again in my life make a made-from scratch-cake. Let’s be honest, the man is seriously lucky to get any cake after that comment.